The page loading time is one of the major challenges for every blogger and website builder. Google has now started to calculate your website speed for search rankings. So you need to keep an eye on website loading time, called for website performance monitoring. The web application performance testing & mobile speed test is the method used for measuring the performance, loading time and stress testing of websites, and web apps too. The landing page speed test is so much important to know your website performance. Those pingdom speed test tools are much popular in the market but there are lots of sites and are used to monitor website performance. So no more need to ask to check my website performance and if you are searching for how to check website loading speed, free website loading time optimization, websites to check loading time online or page loading time calculator or website load test then you are on right page. Speeding up the website is so much important these days; so I have listed the best website performance testing tools that will help you to optimize the page loading time. With the help of mobile friendly test learn how to check page loading time, how to do website performance testing and then blog optimization for better SEO. Learn how to monitor website performance. Try the following FREE online website testing tools to test the time required to load any page of your website. For website performance monitoring, you need to keep in mind that, with better SEO and for improved user interface, like you site content it's much more essential to load your blog as fast as possible. In my previous work, I have had shared 5 Advanced Tips For Making Blogger Blog To Load Faster. Moreover, if you have read my recent tutorial on How To Setup Free CloudFlare CDN For Your Blogger Blog To Boost Website Performance then you will get known how to speed up page loading time. If you notice in your analytics, you can see, you getting more than 50% of traffic from mobile. You required to run mobile friendly test regularly to improve the website loading time. Google love fast loading website and surely it will help you to improve PageRank. Website speed improves ranking [PageRank] in search engines like Google and faster pages result in higher customer engagement, retention, and conversion. This is on top of website performance testing tools. This provides detailed reports and simple solutions. This is new but most effective website performance analysis tools. I always used to use it on the regular basis. This is one of the best website testing tools to measure web page loading time. And it will help you to find any error who affect or block page to load. These pingdom speed test tools are used to check loading speed of websites, search bottlenecks and its report will help to resolve any page loading errors. Like pingdom speed test tools, this is also best website performance testing and monitoring tool. Check my website performance with this online website tester site. It is the best mobile speed test tool and this speedy, high-tech, website performance monitoring robots will check everything about your site and provide an advanced report. 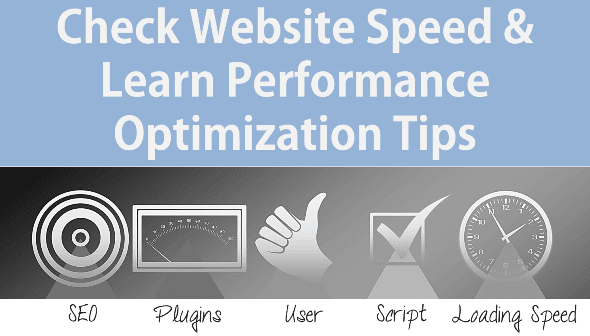 Test your website loading speed and check website performance. Its website speed test Results are very clear and detailed report will help to find bottlenecks in the waterfall. This is one of the interesting website performance analysis tools that will allow you to test your site on various browsers. This is a new web page analyzer service. Last but not least, it's an online website performance testing, monitoring & analysis tool that provide webmasters with valuable information about the loading speed of their blog or website.